When you want to save the attachment of a received fi le on the hard disk, the save dialog always shows ‘My Documents’ as the default folder. But if you always save the fi les into another directory, you fi rst have to navigate through folders to get to it. From 2003 onwards, you can change the default setting for the save folder in the registry, and that too, separately for all Office programs. First, open the registry editor. Type the ‘regedit’ command directly in the search field of the start menu and press [Enter]. Now, confirm the user account control query with ‘Yes’ or with ‘Continue’. In XP, first open the command dialog through ‘Start | Run’ and enter ‘regedit’. 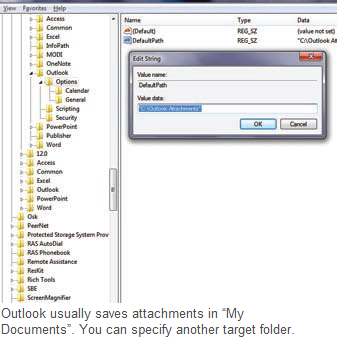 For Outlook 2003, navigate to the ‘HKEY_CURRENT_USER\Software\Microsoft\Office\11.0\Outlook\Options’ key in the Editor. For the 2007 version, the correct key is ‘HKEY_CURRENT_USER\Software\Microsoft\Office\12.0\Outlook\Options’. Here, open ‘Edit | New | Character string’, type in the name ‘DefaultPath’ and press [Enter]. Now double-click the new element to edit it. As a value, enter the desired path completely, including the drive letters and confirm with ‘OK’. Make sure to put the path specification in double quotes if it contains any spaces. Then close the registry and re-start Outlook. In the future, the file dialog will directly open the specified folder.